Shaye Cohen’s third edition of his work about Jewish life from the Maccabees to the Mishnah is most valuable as an overview. Oddly enough, he offers the most poignant critiques in his third edition preface, writing that sometimes he "speaks about "jews"… where [he] would now be more careful and write "Judeans" " (xi). He goes so far as to say that if he were to rewrite the book, "there would be no end" (xi). It is divided into eight chapters. Chapter One discusses important terms for historians studying this period and provides a succinct summary of the exile to the formation of the Talmud Bavli. Chapter Two engages with the relationship between Jews and gentiles through the major rebellions and wars, Hellenistic cultural influence upon Jews, and social spheres of interaction. Chapter Three presents the Jewish religious praxis and belief. Following, he disseminates the Jewish communal institutions. Chapter Five moves closer towards addressing Christianity through discussion of the sectarian and normative Judaism. Chapter Six explores the development of the Jewish canon and how the developments impacted the transition to Rabbinic Judaism. Chapter Seven, thus, explores how Rabbinic Judaism emerged. Finally, Chapter Eight, the new addition to his work, argues that limited interactions between Jewish and Christian communities contributed more a "parting of ways" than any major event that caused a rift. One challenge Cohen faces is the focus on history and theology therein. As a historian, Cohen recognizes his limitations. It is for this reason, though, that I greatly appreciate his work. He is capable of producing an entry level book that demonstrates proper historical analysis of theological and life developments. Even as a Third Edition, his analysis is still important because it allows students and lay people to engage with trends in scholarship. I do, though, wish there were more footnotes. While there is an appendix of suggestions for further reading, the inexperienced person may find difficulty in actually exploring specific areas of interest from his work. Perhaps footnotes with chapter or page references would correct this minor issue and help people to further explore scholarship. A greater issue with his work is that, although it is valuable as a basic entry level work into ancient Judea, there is some out of date information. This is problematic because the information is implicitly scholarly consensus. Essentially, inexperienced or uncritical readers will not recognize certain elements and begin to assume that they are relevant to current scholarly trends. I turn to two examples to demonstrate. First, as mentioned previously, Cohen consistently references "Jews" rather than "Judeans". Realistically, most readers will not read the Third Edition Preface in which Cohen explicitly notes that he should have used the term "Judean". So the average reader will likely follow after the book and continues using the term "Jew" when "Judean" is a far more accurate term. Secondly, his discussion of the Zadokite priests is outdated, as his historical presentation assumes their existence as a historical reality. In the recent monograph entitled Priestly Rule: Polemic and Biblical Interpretation in Ezekiel 44 (De Gruyter, 2015), Nathan MacDonald’s analysis of various texts connected to Zadok validates the current trend of skepticism surrounding the existence of a historical group of the Sons of Zadok or Zadokite priesthood. Succinctly put, "the fact that we find no other references to the sons of Zadok means that we lack the evidence for the Zadokites of scholarly theory, a distinguishable group of priests that claimed physical descent from Zadok" (MacDonald 2015, 145; see also Alice Hunt, Missing Priests: The Zadokites in Tradition and History, 2006). The two previous example are representative of smaller details that the inexperienced reader could take to be scholarly consensus. With regard to the newest addition, Chapter Eight on the parting of ways of Jews and Christians, it is a valuable contribution as it makes available Cohen’s recent argument from his 2013 chapter about the relationship between Judaism and Christianity in the 1st century CE (Partings: How Judaism and Christianity Became Two, edited by Hershel Shanks, 2013). Overall, that is the greatest benefit of the Third Edition. Especially for introductory courses on Judaism, Cohen’s work is an excellent addition. With the exception of more nuanced details, the framework which he provides allows readers to engage with ancient Judaism on its own terms from a historical perspective. Original review posted at The Biblical Review. Cohen, Shaye J. D. "From the Maccabees to the Mishnah, 3rd Edition." Ancient History Encyclopedia. Last modified January 06, 2016. https://www.ancient.eu/review/97/. 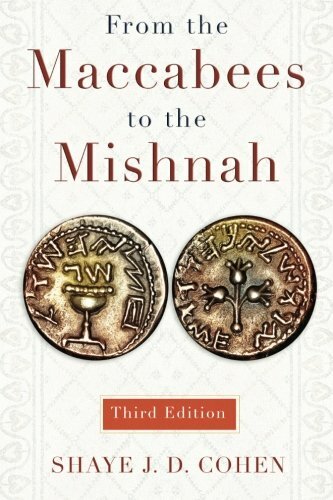 Cohen, Shaye J. D. "From the Maccabees to the Mishnah, 3rd Edition." Ancient History Encyclopedia. Ancient History Encyclopedia, 06 Jan 2016. Web. 18 Apr 2019.